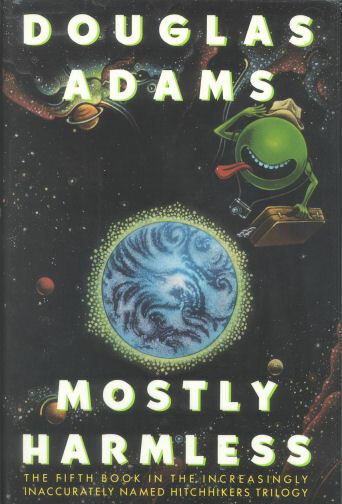 The title Mostly Pointless is inspired by Mostly Harmless, a novel by Douglas Adams, the fifth and final book of The Hitchhiker’s Guide to the Galaxy series. It is described on the cover of the first editions as the Fifth book in the increasingly inaccurately named Hitchhikers trilogy. The title comes from a joke early in the series, when Arthur Dent discovers that the entry for Earth in The Hitchhiker’s Guide to the Galaxy consists, in its entirety, of the single word “Harmless”. His friend Ford Prefect, a contributor to the Guide, assures him that the next edition will contain the article on Earth that Ford has spent the last few years researching – somewhat cut due to space restrictions, but still an improvement. The revised article, he eventually admits, will read “Mostly harmless.” The excerpt from the book is quoted below. Mostly Pointless is plagiarised? Yes, you could safely say so. Remixed, may be. For the uninitiated, here’s a list of all the five books of the increasingly inaccurately named Hitchhikers trilogy.